We've gotten word from our friends at HTC that they, along with TELUS, will launch the HTC Amaze 4G this Friday November 4th. We've seen the Amaze 4G launch on T-Mobile in the US and we are glad to see such a powerful phone come to Canada relatively quickly. For those unfamiliar with the Amaze 4G, it's an Android 2.3 powered smartphone with a 4.3-inch qHD display with a 1.5GHz Dual Core Snapdragon processor. Chcke out the press release with pricing details after the break. TORONTO, Nov. 2, 2011 /CNW/ - Today HTC and TELUS announced the Android™ 2.3-powered HTC Amaze™ 4G smartphone will be available in Canada on November 4. Equipped with a powerful dual core processor and download speeds of up to 42 megabits* per second via TELUS' HSPA+ dual cell network for a rich multimedia experience, the HTC Amaze 4G not only gets it all done - but gets it all done fast. The HTC Amaze 4G boasts a 4.3-inch super LCD HD screen and blazing fast speeds for a 16:9 full screen cinematic experience whether you're streaming an HD clip of a concert from Facebook® or showing off your own sharp, striking images, with no cropping or black bars. "Canadians are looking for the newest all-in-one mobile solutions to lighten their pockets or purses without compromising quality, features or performance. They want not only a smart phone, but a truly amazing one," said Rick Babington, executive director, HTC Canada. "We're thrilled to introduce the HTC Amaze 4G with fully loaded camera and video features on TELUS' fast, reliable 4G dual cell network. This phone has it all: blazing fast speeds that keep up instantly with busy lives, and high quality video and camera features that offer endless entertainment on-the-go." Dedicated photo and video recording keys, an 8 megapixel camera and 1080p HD video recording transform the HTC Amaze 4G into a true home theatre in the palm of your hand. The HTC Amaze 4G is designed for even the most discerning photographer, with a fully-loaded 8MP main camera, 2MP front-facing camera for HD video calls, 1080p video capture, auto-focus, F2.2 AF, 2x LED flash and super-fast shutter speed for quality photos even in low light conditions. The HTC Amaze 4G also includes a burst feature which makes it easier than ever to capture the perfect shot. Burst takes five quick shots in succession and lets users choose the one they like best. "Our customers have told us they are looking for state of the art devices coupled with unparalleled mobile experiences, and with TELUS and the HTC Amaze 4G, that is what they're getting," said David Fuller, TELUS Chief Marketing Officer. "With its dual core processor and exceptional multimedia capabilities, coupled with TELUS' HSPA+ duel cell network that reaches more than 74 per cent of Canadians, this is one powerful smartphone. And with TELUS' commitment to clear and simple value that puts customers first, HTC Amaze 4G users get the best of both worlds. Further, Amaze 4G users can take advantage of our innovative in-store and online Learning Centres to learn how to get even more out of this superb device." Sharing moments that matter is made easy with HTC Sense™, HTC's unique user experience that puts people at the centre. 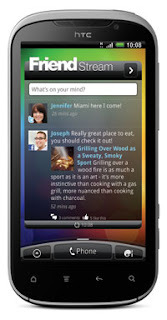 FriendStream™ allows users to see Facebook, Twitter and Flickr all in one place without unlocking the phone. The next time a friend calls, their most recent social status appears directly on the screen. Access to more than 250,000 free and paid apps from the continuously growing Android Market. *Manufacturer rated peak download speeds of 42Mbps. Average expected speeds of 7-14 Mpbs. HTC Corporation (HTC) is one of the fastest growing companies in the mobile phone industry. By putting people at the centre of everything it does, HTC creates innovative smartphones that better serve the lives and needs of individuals. The company is listed on the Taiwan Stock Exchange under ticker 2498. For more information about HTC, please visit www.htc.com. In support of our philosophy to give where we live, TELUS, our team members and retirees will, by year-end 2011, have contributed $245 million to charitable and not-for-profit organizations and volunteered 4.1 million hours of service to local communities since 2000. 11 TELUS Community Boards across Canada lead TELUS' local philanthropic initiatives. TELUS was honoured to be named the most outstanding philanthropic corporation globally for 2010 by the Association of Fundraising Professionals, becoming the first Canadian company to receive this prestigious international recognition.